Laggania cambria, life size model (about 60 cm) created by Espen Horn, København, Danmark, based on fossils from Burgess Shale (middle Cambrian), Canada; Staatliches Museum für Naturkunde Karlsruhe, Germany. Photo: H. Zell. The largest and most impressive animals of the Cambrian and Early Ordovician periods, the Anomalocaridids represent the culmination of dinocaridid evolution (although not the msot lasting legacy; that honour would go to their somewhat smaller descendants the early arthropods). The earliest known Anomalocaridid to date is Cassubia infercambriensis, from the earliest Cambrian of Poland, predating the first trilobites (Dzik & Lendzion 1988). Anomalocaridids, like Dinocaridids in general, are best known from the mid Early Cambrian through to the mid Middle Cambrian. Their rarity as fossils thereafter is due to their non-mineralised (soft-bodied) cuticle and the the scarcity of post- Midlde Cambrian lagerstatten. It is now known that large bodied anomalocaridids continued well into the early Ordovcian at least (Van Roy & Briggs 2011). 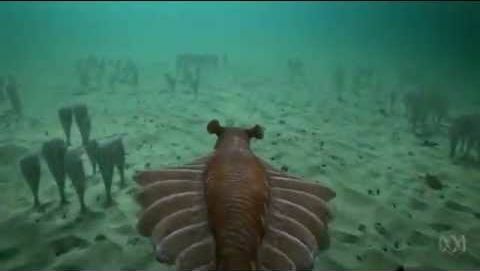 In life anomalocaridids would have been easily recognisable (see image above) as large segmented, swimming arthropod-like animals with a distinctive pair of raptorial appendages under the head, huge compound eyes (Anomalocaris had extremely acute vision even by contemporary standards (Paterson et al 2011)), and pairs of swimming lobes along the trunk. The mouth is a circular or rectangular structure resembling a pineapple slice, consisting of a ring of hard sharp teeth in the central orifice. The teeth did not meet in the middle, which led to the hypothesis, which we reject, that anomalocaridids were harmless plankton feeders (Hagadorn, 2009) . In Hurdia at least, there were further rows of teeth behind the first (a bit like the creature from Alien perhaps), while Anomalocaris itself would have used a different killing stratergy, using its powerful arms to grab and shake a trilobite to pieces (Nedin, 1999). 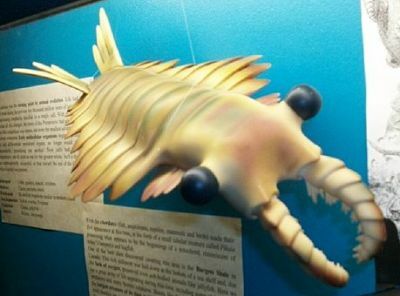 When Stephen Jay Gould first popularised this creature in his book Wonderful Life, and for some years afterwards, it was not known what phylum of organisms Anomalocaris belonged to. It was frequently lumped with arthropods on the basis of its jointed body; however, other creatures like annelids have also evolved a segmented body). An alternative explanation was that it was a kind of aschelminth (pseudocoelomate worm), as indicated for example by its asymmetrical mouth. Without doubt it is among the "molting animals" ( a group that includes many segmented animals). Its difference from modern organisms was considered a reminder, as are all the problematica, of the diversity of life, and the fact that the type of creatures around at present are only a fraction of the number and diversity that have ever lived. Thanks to cladistic analysis and new fossil discoveries we know a lot more about Anomalocaris than we did in the 1980s. We know now for example that it is a transitional form between lobopods and true arthropods, although whether it is classed as a lobopod or an arthropod depends on where you draw the line. Despite arguments by Hou & Bergstrom (e.g. 2006) it is no longer considered a giant aschelminth worm, or anything as alien as Gould imagined. In fact the aschelminth attributes are simply inherited primitive features (plesiomorphies) possessed by ancestral ecdysozoa. The current consensus is that Anomalocaris is an arthropod whereas its more primitive cousin Kerygmachela is a lobopod. 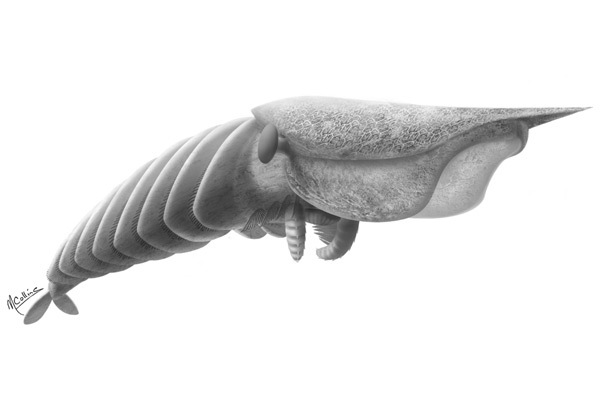 This despite there probably more similarities between Anomalocaris and Kerygmachela than between Kerygmachela and typical lobopods, or between Anomalocaris and true arthropods. The first complete Anomalocaris fossil found, Royal Ontario Museum, Toronto. Early Cambr- early Ord, Cosm. Trunk walking legs either absent or if present not sclerotised (Hou & Bergström (2006)); large size (20 to 100 cm) . With Arthropoda: Hypostome; arthropodization of appendages (Daley et al. 2009) ; very large (~16,000 lenses) compound eyes consistent with a lifestyle of midwater predators in the photic zone (Paterson et al 2011)6. "In accordance with the criteria established by Collins (1996), all anomalocarids may be diagnosed as being bilaterally symmetrical, with two distinct tagmata, but other features, such as lateral lobes, grasping appendages, biramous appendages, form of the trunk, and anterior tagmata vary between types of genera. "Based only on the current descriptions of anomalocarids, and a casual observation of the available evidence, I have listed several groups possibly comprising distinct grades of anomalocarid body organization. The inadequately described Chen and Zhou arthropod (1997), if it is truly an anomalocarid, could very well represent an ancestral grade of anomalocarid body organization unknown in other described forms. Groups 1, 2 and 3 comprise a grade of genera possessing a soft cuticle, simple body organization, and uniramous trunk appendages. Group 4 contains the grade of genera with complex degrees of tagmosis and sclerotization, and biramous trunk appendages, while group 5 represents the grade of genera that have made a radical departure from the body designs of the other grades. A thorough cladistic analysis incorporating all described and undescribed taxa will ultimately determine the viability of this concept" . Table 1: Minicuccis (1999) five grades of anomalocarid organisation. Since Anomalocaris lacks any mineralised tissue, it seemed unlikely that it would be able to penetrate the hard, calcified shell of trilobites. One possibility is that anomalocarids fed by grabbing one end of their prey in their jaws while using their appendages to quickly rock the other end of the animal back and forth. This produced stresses that exploited the weaknesses of arthropod cuticle, causing the prey's exoskeleton to rupture and allowing the predator to access its innards. This behaviour is thought to have provided an evolutionary pressure for trilobites to roll up, to avoid being flexed until they snapped (Nedin, 1999) - Wikipedia. 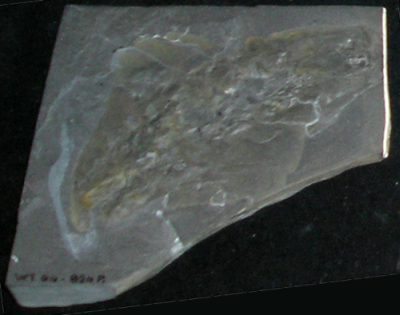 Although Anomalocaris did not seem to have the inner tooth rows of Hurdia Daley et al. 2009 and hence was unable to close its mouth, it would certainly have used its circular outer teeth for other purposes, perhaps to break open the weakened trilobite carapace. Hurdia Hurdia victoria Walcott 1912, and Hurdia spp. 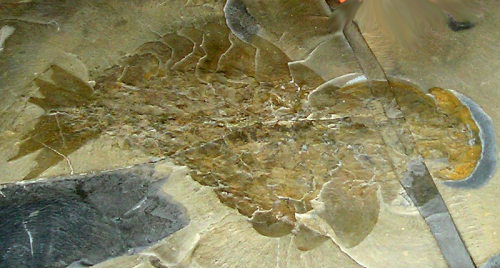 Early to Middle Cambrian; known from six Burgess Shale localities in the Canadian Rockies (mid Middle Cambrian), as well as in the Marjum Formation of Utah (slightly later Middle Cambrian), also the Middle Cambroian of Bohemia (Proboscicaris hospes), and possibly Nevada, and China (Liantuoia inflata and Huangshandongia yichangensis from the Early Cambrian Shuijingtuo Formation in Huangshandong, Yichang, West Hubei; originally considered Crustacean carapaces) . 69 specimens of Hurdia are known from the Greater Phyllopod bed, where they comprise 0.13% of the community (Caron & Jackson 2006), although some of the specimens identified with other species may belong; according to Daley et al. 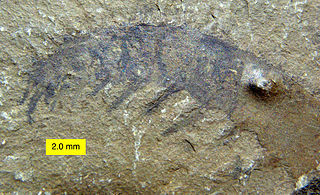 (2009), Hurdia is the most common anomalocaridid in at least the Walcott Quarry.